The NESTLÃ‰ FITNESSE 14-Day Program encourages me to exercise! 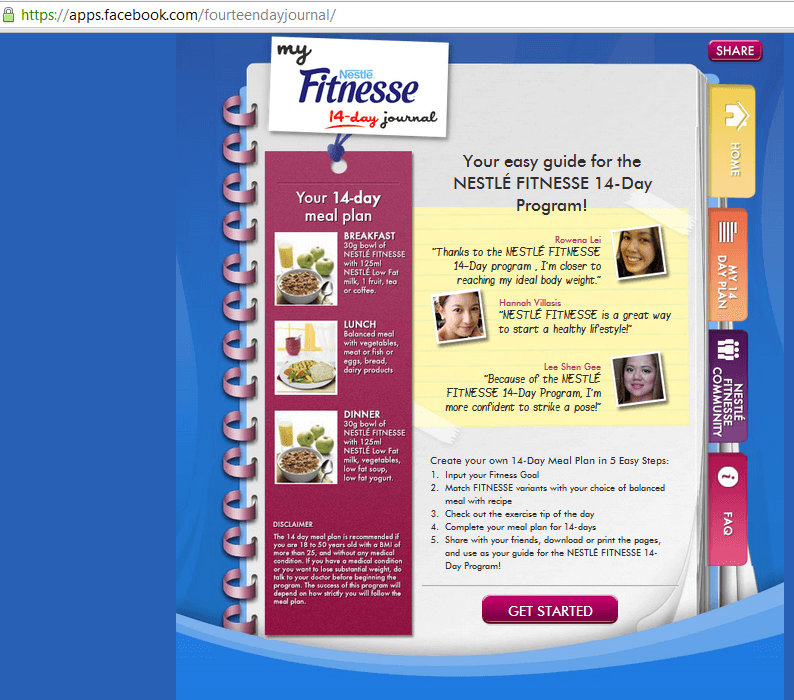 So yes, exercise is good with my new healthy lifestyle kicked off by my 14-Day Nestle Fitnesse diet! Find your exercise! Find the exercise that fits your schedule and your goal. As for me, Iâ€™ve been busy lately but thereâ€™s no excuse to exercise â€“ I exercise at home. The often most neglected part of any exercise is warm-up, stretching and conditioning. And since I burned some good calories after a good exercise at home, I have to put bananas in my NESTLÃ‰ FITNESSE cereal for dinner and maybe add 1 hard-boiled egg for protein (for muscle repair). My goal is to lose the fat and gain healthy muscle! The most important part about the NESTLÃ‰ FITNESSE 14-Day Program is that it trains my body to crave less, eat healthy, less of the junk, but at the same time it doesnâ€™t deprive me of a full-on healthy meal every day! It trains my body to eat more nutritious food that complements my exercise, making it more effective in losing weight! They also say, the more you exercise, the more you improve your bodyâ€™s metabolism. NESTLÃ‰ FITNESSE 14-Day Program also has the same goal. By eating 2 meals of NESTLÃ‰ FITNESSE Cereal, 1 balanced meal, and 2 healthy snacks in between is actually more effective in improving my bodyâ€™s metabolism than skipping meals and starving myself. This is based on my past experiences when I do 2-day crash diets and then end up gaining more weight than I should. Good news friends! To aid you in your fitness goals, NESTLÃ‰ FITNESSE gives you the 14-day Journal app on Facebook! If youâ€™re clueless on what exercise you need to do, donâ€™t worry! 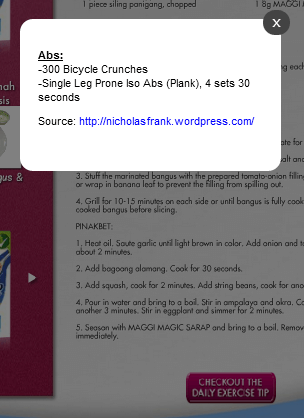 Just log into your NESTLÃ‰ FITNESSE 14-day Journal and click on the Daily Exercise Tip button! Now you donâ€™t have any excuse to skip exercise along with your NESTLÃ‰ FITNESSE 14-Day diet! Hello admin, I’m inviting you to join us at SWA – Supreme Wealth Alliance. Our main product here is the Supreme Wealth Library. You can check my blog site for more info at pinoyfinancialsuccess.blogspot.com. Aaaarrgghhh! I just cheated on my diet and now … ermmm … I need to go back to zero waaah! Why are foodies so enticing!!! As long as you have some muscle mass, eanitg healthily will allow your body to naturally (yet more slowly) burn off excess fat.